The hotel is located in the heart of Galway on the corner of Eyre Square, behind the main bus & rail station. Just step out of the front door of our hotel and you are close to all the main city attractions. The hotel is near Eyre Square (renamed John F Kennedy Park), an open green park where one can relax or view the many attractions, including the statue of Paraic O Connaire, erected in 1935 in memory of the writer who travelled the roads with his horse and cart. We Peter and Anne Keeley enjoyed our stay very much in the Victoria Hotel in Galway. The room was very comfortable and big and very near to the lift.The staff were pleasant and helpful.The breakfast was delicious and we look forward to the next break.Our rating is three star. 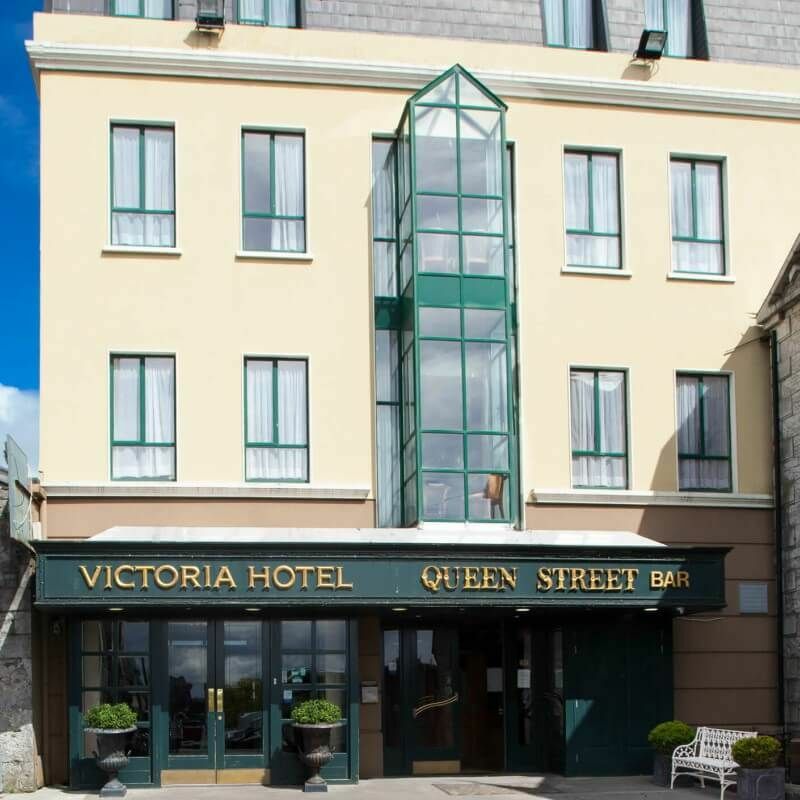 Myself and my husband stayed at the victoria hotel galway for one night. Its location was great for shopping,dining and nite life.The staff were excellent,the room was a great size, and was spotless.And the breakfest every morning set us up for the day. Needless to say we will be back to the Victoria hotel on our next vist to Galway. Myself and my boyfriend stayed here for one nite in december, i have to say from the outside you wouldnt know what to expect but when u go in it is really lovely, Really stylish and the bar was lovely and cosy, The rooms are also very nice very modern and cosy too, It is very central shopping centre just a couple of minutes away as it rained at lot when we were there and we were still able to enjoy shopping in the december sales, Also hotel is so central also a couple of minutes walk from the main pubs, all in all really enjoyed our stay at the victoria and will definitely be going back, Thankyou. We enjoyed our one night stay very much in the Victoria Hotel. The breakfast was excellent and the staff were very friendly and looked after our needs.However we would have liked bar food as it was a very cold wet night and we had to go out for food. We are senior citizens and thats the reason we would have liked the comfort of eating in doors. Peadar & Anne Keeley.We would give it three stars. Greeted at reception by very friendly staff, given directions to Hynes car park. The hotel was warm and clean. Bedroom was large and spacious . Rooms are cleaned on a daily bases, towel changed daily if required. Breakfast had a great choice eat as much or as little as you want. All the staff were very friendly and helpful. Would highly recomend this hotel for a good and convienent base for staying in Galway City.